While going for a hike might be literally just a walk in the park, the trails in Vancouver are very rugged so you need to be prepared. The weather could turn bad, you could get lost, you could get hurt, or the hike could just take longer than you think. That’s why every time I go on a hike, I carry some basic just-in-case supplies. 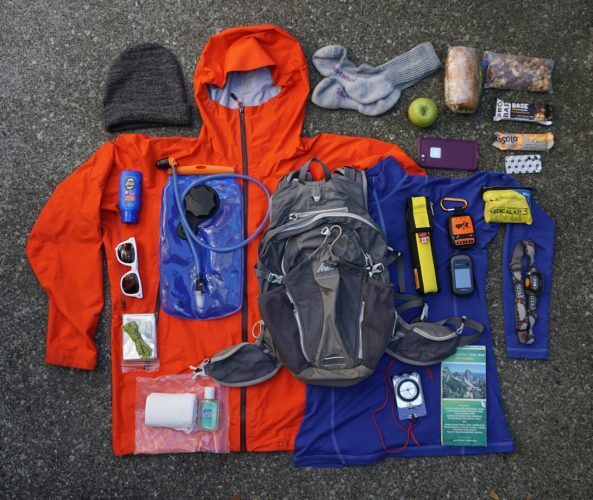 My gear list is based on the recommendations set out in The 10 Essentials, a list that The Mountaineers club of Seattle put together in the 1970s and has been adapted for local travel by North Shore Search and Rescue. Here’s what’s in my pack for summer day hikes. Extra clothing is essential when hiking as it can often be much colder or stormier in mountains than it is in the city. As well, if you get lost or injured, you may need to spend the night out in the mountains so clothes that keep you warm and dry will come in handy. We live in a rain forest so I always bring a waterproof breathable rain jacket on all my hikes (even if the forecast calls for sun) because you just never know. I also always bring a fleece jacket or thermal shirt, and a light toque as those are easy ways to add warmth. Lastly, I always bring an extra pair of socks in case my feet get wet (from stream crossings, puddles or rain) and because they can double as mittens in an emergency. Having lunch on top of a mountain or next to a lake is one of the best parts of hiking, so I always pack a sandwich and some snacks. But I also always keep a few extra granola bars or energy bars in my backpack that I don’t plan to eat – they are for emergencies. On a hot day or a long hike, I bring at least 2 liters of water per person. I also carry a small package of water purification tablets to make stream or lake water safe to drink in case I run out of water. You can buy them at your local outdoors store. Even if I am just going on a simple hike, I bring a map of the area. I prefer topographic maps that show trails, streams and elevation contour lines because they give me a better sense of where I am and what terrain lies ahead than simple maps that just show the main trail. If I end up on the wrong trail, a good topo map will make it much easier to figure out where I am and help me get back on track. I also pack my compass, even though I only expect to use it if I get lost or am unsure of the route. On longer hikes or ones with more route-finding, I might also bring a GPS unit. In an emergency, it’s important to be able to call for help. I make sure I start a hike with my phone battery fully charged and I often put my phone in airplane mode to save battery. On longer and more remote hikes I also carry a SPOT satellite messenger since many local hikes don’t have cell service. As a backup, I use a more low-tech option: a whistle. Every single one of my hiking backpacks has a small but loud whistle attached to the shoulder strap. Your voice will get hoarse and tired yelling for help, but as long as you can breathe, you can keep blowing a whistle and hopefully nearby hikers or Search and Rescue volunteers will hear you. All hikers should carry at least a small first aid kit. If you buy a premade kit make sure you look through it and add anything extra that you think you’ll need. For day hikes I carry a small minimalist first aid kit that contains band-aids in lots of different sizes, blister dressings, painkillers, antiseptic wipes, gauze, and medical tape. On summer hikes sun exposure can lead to debilitating heat stroke, snow blindness or just a painful sunburn. I pack a small tube of sunscreen, SPF lip balm and a pair of sunglasses. One of the easiest ways to get lost on a hike is to get caught out after dark without a light so I always tuck a headlamp into my backpack. I also have a small emergency light in my first aid kit so I have a backup light source as well. From spring through fall you will share most hikes in the Vancouver area with bears. Many people never see one but I have encountered bears often and like to be prepared. I always carry my bear spray in the outside side pocket of my backpack where it is easy to reach. A knife is an important item to have in your hiking pack. It is useful for cutting gauze or tape for first aid, making kindling for an emergency fire, cutting up an apple for a snack and lots more. Another essential item is a way of making a fire in an emergency, either as a survival fire if you spend an unplanned cold night outdoors or as a signal fire. I take along a few waterproof matches in a sealed plastic bag but you could also bring a lighter. I’m already carrying toilet paper that I could use to help start a fire but you can also buy commercial wax or chemical based fire-starters that work better. If I get lost or injured I may be waiting for help for a long time so I carry a very basic emergency shelter: a space blanket and a length of cord. I can wrap myself in it or use it as a tarp. Instead of a space blanket, you could bring a large garbage bag or invest in an emergency bivy sack. Each person should have their own backpack in case your group becomes separated – that way everyone has their own supplies. Any backpack will do – you don’t need a special hiking pack. But if you are shopping for a day hiking pack, look for something with a capacity of between 15 and 30 liters which is a good size to carry everything you’ll need to be prepared. Keep all of your regular hiking supplies together at home so you don’t have to worry about tracking them down on your way out the door. I keep everything in my backpack so I’m ready to go. I also keep all my emergency supplies together inside my water resistant first aid kit so it’s all in one easy-to-grab spot. This includes my first aid supplies, pocket knife, emergency light, water purification tablets, matches and all first aid gear. Before you head out on your next hike, take a few minutes to go through your supplies and ensure you have everything you need to be prepared. You never know what will happen in the mountains! Excellent post Taryn! Thank you. I learned a lot by reading this and will be modifying a few of my items and adding others. This was a good article! One thing about the topo map that I learned from canoe tripping is to get it laminated (a store such as Staples can do it for a few dollars), or put it in a freezer bag with a watertight enclosure to protect it from rain or an unintentional dunking. I’d throw in a SAM splint. Light and Small, and when someone breaks three bones and dislocated an ankle like I did? That splint will be worth it’s weight in gold. Thanks for posting this,Taryn, It’s very helpful. Some years ago I used to do quite a bit of hiking around the local trails of the Vancouver area and into the valley but not so much in the last 25 years. Only 2 or 3 that I can remember. Anyway, long story short, I will be celebrating my 70th birthday next year and I have set a goal to climb Allouett Mt. next June to mark the occasion with a couple of friends. I have always been diligent about being prepared and thought I had better refresh my memory. Thank goodness for Google and thanks again for putting this out there so fathers can be equipped,ready and, safe. I have bookmarked this to refer to as the day gets closer.